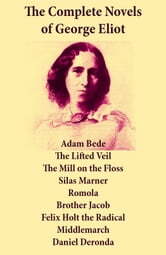 This carefully crafted ebook: “The Complete Novels of George Eliot: Adam Bede + The Lifted Veil + The Mill on the Floss + Silas Marner + Romola + Brother Jacob + Felix Holt the Radical + Middlemarch + Daniel Deronda” is formatted for your eReader with a functional and detailed table of contents. Mary Ann (Marian) Evans (1819 – 1880), better known by her pen name George Eliot, was an English novelist, journalist and translator. She was one of the leading writers of the Victorian era. Her novels, largely set in provincial England, are well known for their realism and psychological insight.